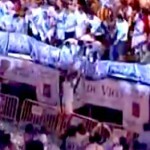 Players and fans of Spanish soccer team Celta Vigo went a little nuts on Sunday, throwing a huge, raucous party at the Plaza de America in the northwestern Spanish city of Vigo. What was their cause for celebration, you ask? Why, getting promoted from Spain’s Segunda División to the Primera División, better known as La Liga! You see, after a period of success in La Liga during the late 1990s and early 2000s—which even included a trip to the Champions League qualifying round—Celta Vigo has been stuck in the second tier of the Spanish soccer league system since 2007. But on Sunday, a 0-0 draw against Cordoba guaranteed them a second place finish in the Segunda División, and promotion to La Liga next season. And for a relatively small Spanish city, that’s a big deal. So everyone in Vigo was ecstatic. They set up a stage in the town square for the team to stand on, and everyone came out to party. There was singing, dancing, chanting, flag-waving, confetti, fog machines, and obviously, plenty of drinking…so it’s really no surprise that one of the players fell off the stage. After getting a little too excited and a little too close to the edge, Vigo midfielder Christian Bustos fell over that edge. What’s amazing, though, is that he actually managed to stay on his feet, before hopping right back on stage. When was the last time you saw a soccer player fall down and get right back up without rolling around on the ground for 3 minutes with his hands on his face?